FROU FROU is a slow fashion house that does not compromise in design, quality and ethical standards. We produce in Cologne ourselves and safeguard a garment that I am extremely proud of. Contemporary lifestyles, oil paintings, lush nature and green tea inspire my designs – however, perhaps they are influenced more by music than anything else. The three young souls in my house also provide an endless resource of inspiration, on top of 17 years of experience. A garment engulfs many of our senses, it is far more that just visual. We feel the fabric, take in its scent and hear the sound of its movement. Envisage the rustling susurration of dresses in former times. This is what the word FROU FROU means historically. And why not conjure such traditions? I adore working with linen, the oldest cultivated plant fabric in Europe. It is a precious material that deserves to be handled with great diligence. It provides ideal natural ventilation and efficient sun protection, much like wool. Linen is robust, dirt-repellent and fabric care is effortless. Making it even more perfect for children’s garments. 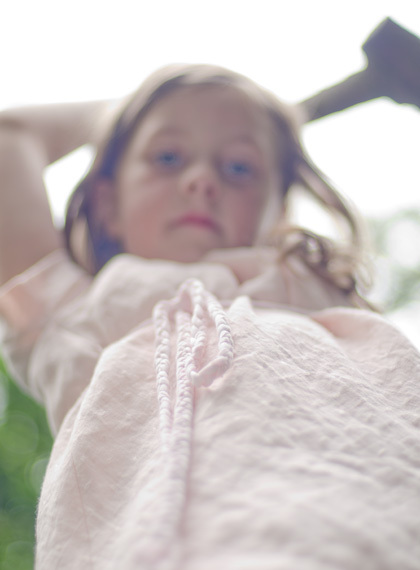 Linen is also highly recommended for kids with sensitive skin. On top of the long list of benefits, the cultivation of linen is very kind to our environment. During an average European summer, the flax plant (from which linen is derived) requires no irrigation, and producing the fabric requires much less water and energy than cotton.